I did a bit of research on the Kingz 420 Light Kimono and noticed it received lots of good reviews, unfortunately when I went out to purchase one, they were nowhere to be found except online. I do not like to buy anything online unless I am 100% sure that I know it will fit like I like it, which is why I will only buy t-shirts online. As you all probably well know each kimono is different, whether is be the cut or all the different sizes that they come in, you can not just look at their charts and say ok that’s my size. 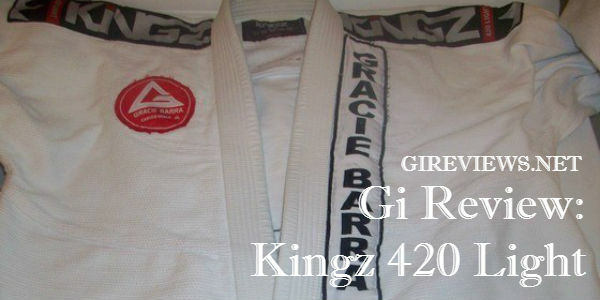 The Kingz 420 Light BJJ Gi is made of 420gsm fabric for the jacket and is a lighter version of their Kingz 550 Comp BJJ Gi (420gsm fabric vs 550gsm fabric). It’s a great gi for competition, but holds up to daily training as well. 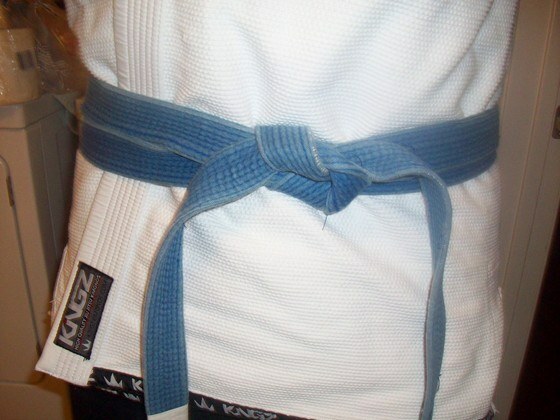 The gi is very lightweight (roughly 1lb. lighter than the Rip Stop and 1.5lbs. lighter than the 550 Comp). It’s almost complete preshrunk and the stitching is top notch. The jacket has logo seam taping on the wrists and along the bottom of the jacket. There are also some cool patches on the skirt and on the shoulders. The lapel is made of rubber, but Bruno from Kingz has assured me that it will not bend in extreme heat (in either dryer or wash). The collar is made of rip stop material. 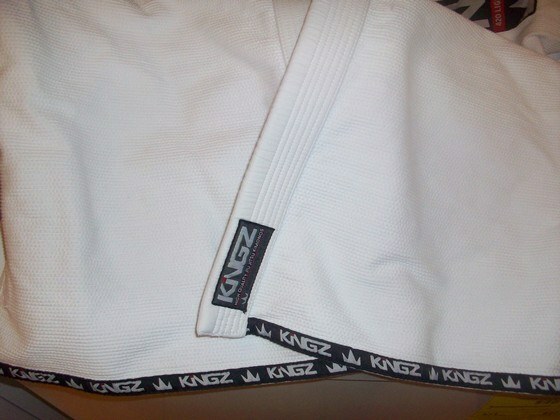 The Kingz 420 Light BJJ Gi pants feature the stretchy crotch that is on all Kingz models. They are a very light 8oz rip stop material (vs. 11oz canvas cotton on the 550 Comp model). They also feature six drawstring loops. The kimono jacket is a 420 gram weight jacket made of traditional pearl weave material and as soon as you pick it up, you feel just how light this jacket really is. The entire kimono is very light, with the A1 weighing only 2lbs 11oz and the A4 3lbs 8 oz, which for us bigger guys to find an A4 that light is awesome! The only patches on the jacket are the Kingz Crown shoulder patches and a Kingz 420 circular patch at the bottom left hand corner of the jacket. I like most people found the Kingz 420 Circle patch to be redundant and unnecessary, which is why that was the first patch to go for me. What I found to be nice touch was the woven Kingz tape at the bottom of the jacket and on the inside of the cuffs. The downside to jacket is the collar it is made of rubber foam and covered with rip stop cotton which is good, but too thin and flimsy for my liking. During training I felt that my training partners could easily grip the collar. 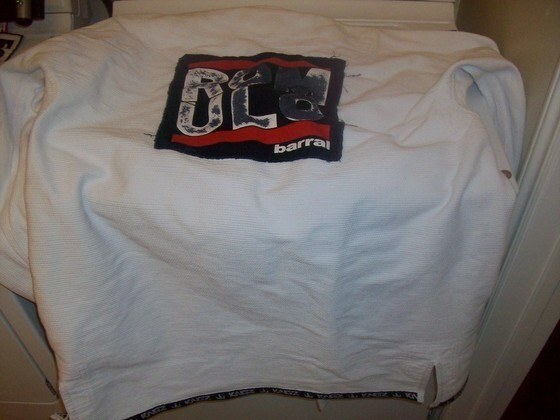 Also after one wash and dry, I noticed already the collar started to become a little more flimsy. The other downside to the jacket is the long skirt; this was too much material and it just ended up feeling like it was getting in the way. During training I did notice it made it easier for my partners to use it against me, it gave them much more material to grab. The pants are made of 8 oz rip stop material with a stretch inseam panel for maximum leg and hip mobility. 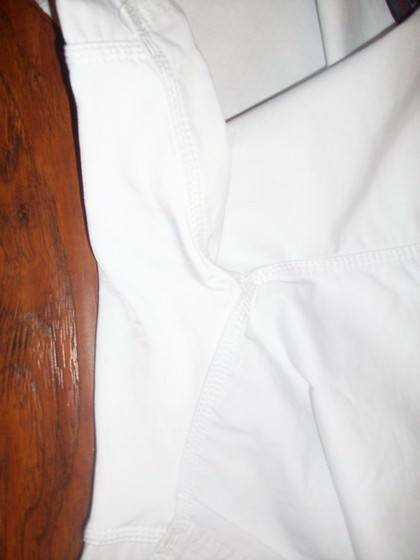 The pants came with double reinforced knee padding, triple stitched with over lapped seam and 6 drawstring loops. What did surprise me of the pants was that it came with a standard drawstring instead of the rope. I have become a big fan of the rope as it helps to better keep my pants in place during hard training sessions. The rip stop material used is of the highest quality; I would compare it to the Atama rip stop pants in both quality and style. They are not like other rip stop pants that seem like they will rip on the first roll or so thin that you can see through them. The added bonus to these pants and I would say the best part was the groin area is made from stretchy lycra material. I really felt the difference when rolling in these bad boys, I did have that fear that the pants would rip and it allowed me more freedom to move. The pants do have that unnecessary circular Kingz 420 patch on the bottom of the left leg, I also removed this patch. Now for the downside, I would have to say is the length, they are a little too short. I purchased an A4 normally the pants are a little long and with time they shrink to my liking. I am 6’0 feet tall and weight 192 lbs, the A4 pants were just at my ankles before washing. After washing they came above my ankles and when training and you are on your knees they ride up higher, which I really did not like. 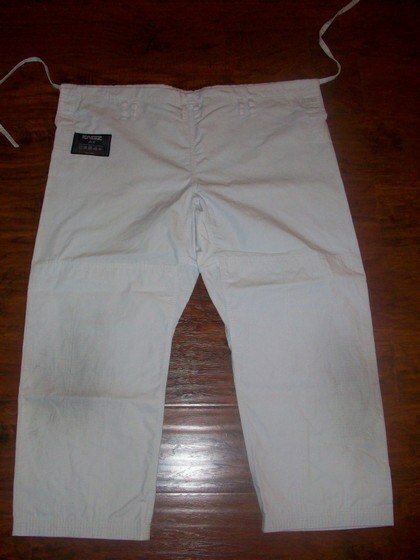 I think they could have made the pants a little longer, especially with how they shrink after one wash. I washed it in cold water and hung dried the pants and yet there was still shrinkage. I purchased this kimono looking for a lightweight kimono, that would be breathable during those Super Hot California summers and that would allow me not to have to cut too much weight during competitions. My reason for purchasing an A4 instead of an A3 was because I actually was able to try on an A3 Kingz 420 jacket and noticed that the sleeves were the right length, but feared that after a couple of washes it would shrink and I would not be able to use it for competitions. Unfortunately for me the body of the jacket is very big and the long skirt really does not make it any better, but the sleeves are the right length. Overall the Kingz 420 Kimono is a very nice lightweight kimono that comes with a great pair of trousers, but unfortunately for me the sizing was a bit of a problem. I do not think I will be purchasing another Kingz Kimono until they have addressed the collar thickness, the skirt, sleeve and pants length problem. 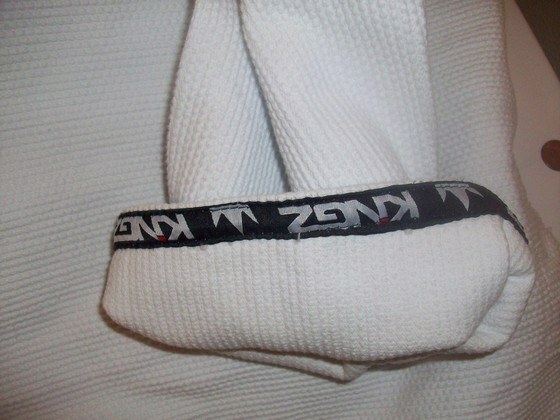 Kingz Kimonos are a fairly new company especially when compared to other companies like Koral & Gameness. Kingz is a company located in Canada, they do not have a website, but they are on facebook. They do provide a website address on facebook, but when you click on the link it redirects you to www.fightersmarket.com. Fighters Market is the official carrier and seller of Kingz Kimonos; if you live in California you can also find them at budovideos. UPDATE (Jan 18, 2017): The Kingz 420 Light gi is no longer available. You can check the company’s entire gi collection via their website here. Seeming how www.fightersmarket.com was the only place left where you could purchase an A4 Kingz 420 Kimono, I decided to take the chance and purchase the kimono online, even though that went against my rule. When the kimono arrived it did not come in some fancy bag or special wrapping, to some that might be an issue, not me I am not big on the packaging. When I first opened the package and saw the kimono, I was very impressed, I thought it looked very nice and clean, just what I was looking for. This is a very plain and simple kimono; it is not one of those flashy over patched bedazzled kimonos. I am not one for all the patches, I always de-patch all my kimonos and put on my school and Professors patches.